Indiandoowopabilly. Traditional Indian music mixed in with doo-wop rock and rockabilly. Indiandoowopabilly. 1. 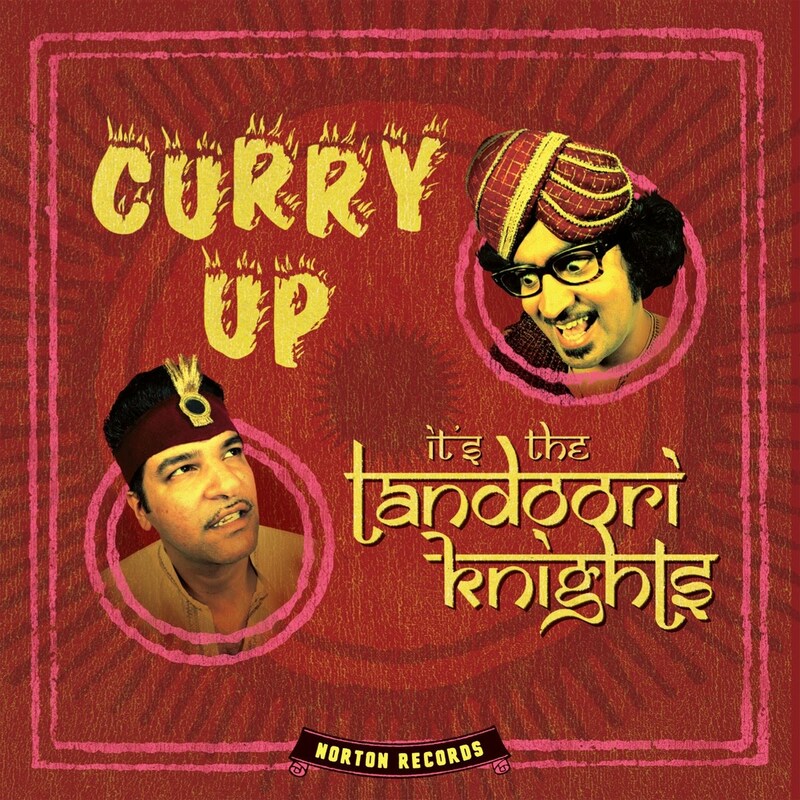 For those of my readers (now that there are apparently more than one of you) who consider themselves somewhat musically adventurous, may I recommend one of this year's most unique albums, Curry Up, It's the Tandoori Knights ('YES, click on the link to hear samples' says Rob in Montgomery Burns voice), by--you guessed it--The Tandoori Knights. Yeah, it pretty much sounds like the ridiculous caption above--and you have to admit without having heard it that that sounds somewhat intriguing, eh? Maybe just a bit? All I can tell you is that it is a fascinating little record. Using all the core instruments of rock but with a sitar thrown in as a foundational undercurrent, Curry Up meshes the traditional with the even MORE traditional--as in traditional Indian music structures. Now I am not Indian and don't claim to know a thing about traditional Indian music--I only know that I've made out with an Indian girl before and I bet she does know something about traditional Indian music and I'm sure that's somehow relevant here. What I also know is that this album sounds like plenty I've heard while simultaneously sounding like nothing I've ever heard. Some songs are sitar driven, some are hard rocking drivers, and others are a mix of multiple styles. Arish Ahmad Khan--better known as King Khan (one of my rock 'n' roll leaders and someone I have a slightly unhealthy man-crush on)--has teamed up with another Montreal under-the-radar rock staple, Bloodshot Bill (I couldn't make up a name like that), to form the Tandoori Knights. Both men strum and strain and laugh through this undeniably fun album while still remaining faithful to a particular concept throughout the album of meshing two seemingly incongruous musical styles. The album grows continually intriguing with each listen and while not for most of you (you probably know who you are, and that's okay), it's worth a listen for those of you always on the lookout for something a little quirky. Or something for your next Indian-themed sock hop. Whatever the case may be. 2. 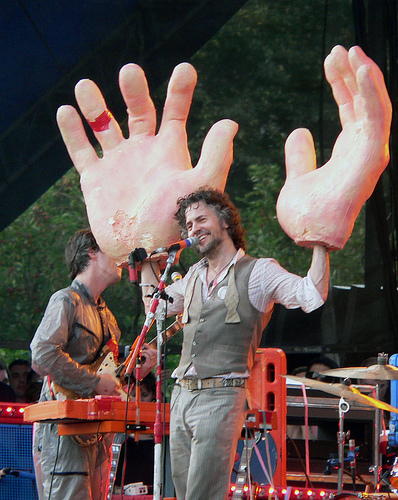 For those of you who live outside of my beloved Oklahoma City area, you may not have heard about the annual tradition that is the greatness of The Flaming Lips playing a hometown show (yes, Oklahoma City is their hometown) every New Year's Eve. I've attended this confetti-filled, man-in-giant bubble, smoke monster of a show the last two years and have never walked away disappointed. If there was ever a band whose stage show was designed for a specific night, it might just be the Lips. The combination of all those effects, the energy of the music, and the overall spectacle makes for a night of grandeur befitting the best New Year's Eve party you'll ever attend. Even if you don't particularly like their music, I challenge you to walk away from one of their shows without having had a ton of fun. To add to an already epic showcase last year, the Lips performed a live cover of Pink Floyd's seminal Dark Side of the Moon in its entirety. This year, the band announced that in addition to their normal show, they'll be playing what many (including myself) consider to be their definitive masterpiece, The Soft Bulletin, in its entirety. The announcement created such a buzz that floor tickets for the show sold out in less than thirty minutes (while in previous years, tickets were slightly easier to come by). Fortunately, I was one of the lucky ones and got my tickets early and you should all know that I keep weapons handy in my house and am also moving said tickets to a new secret location every three hours. Just sayin'. Anyway, if you have a chance to make this show (and yes, there are still ways to get tickets), I can't recommend this enough. Exploding high five with a giant, oversized hand! 3. This dumb little blog is gonna be somewhat prolific in the next few weeks. I mean hey, it's my gift to you in the spirit of the holiday season. Three more life-changing, perspective-altering playlists are coming your way starting in the next couple of days. The third of these playlists will be my favorite dozen songs of 2010 and that will be followed up by my annual, end of year, reason you all fight through each day of your lives and work and get out of bed, "Year in Music" feature. It'll include my favorite albums of the year (the best to me at least) along with another playlist as well as the finely-crafted wordsmithery you've come to expect from me. Please, kids, try to stay focused on the rest of your lives until then. Also, while you're at it, check out some of the quite strong links over there to the right--especially the link to The Spy FM, simply one of the best music stations in the world. For those of you not familiar, the Spy is a truly independent station with tons of favorites along with plenty you've never heard before and will never hear on regular radio stations in this day and age (for my Dallas friends, think of The Edge before it was bought out and turned in to another douche-rock station). A great place to discover discoverworthy tunes. Also, check out my Pandora station at your own risk. But if The Killers come up on the playlist, I can assure you that that is ALL Pandora, ok? Finally, I have some supremely talented friends with blogs who are way better at this than me that you might want to check out (also over there on the right). Alright, enough with all the plugs. I assure you that no one is paying me for those and I can triple assure you no one pays me for this. It's all about my borderline inappropriate love for each and every one of you. See you real real soon soon. 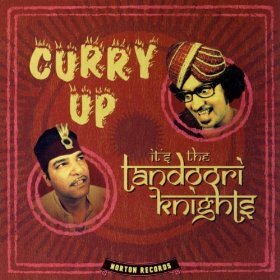 I will be listening to Curry Up very, very soon. Probably when I get home and have a chance to download it from Amazon. Hey! I have unnatural unhealthy love for you, too! yes.